Our super heavy‐duty rotary cutters with integral Accra‐Feed™ caterpillar infeeder/puller. A torque enhancer gearbox is fitted to the cutter motor to increase the cutting power. 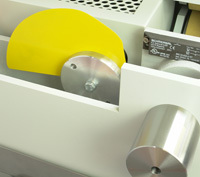 The cutter motor is rated at 17 Nm (15 kW). The torque enhancer gearboxes boost the power level up to a massive 44 kW (3:1 ratio) or 66 kW (4:1 ratio). The integrated puller/infeeder is available with belt lengths of 600 mm, 800 mm or 1000 mm. These super heavy‐duty units are capable of cutting the toughest extruded products such as rigid plastic pipe & profile and Kevlar® reinforced rubber hose. Available in Standard or Plus cutter specification. All machines include the latest Lenze i700 multi-axis servo control system & Siemens TP700 Comfort colour touch-screen (178 mm/7" diagonal). The caterpillar infeeders feature UA (Ultra-Accurate™) twin direct drive servo motors (via zero-backlash planetary gearboxes) for improved infeed accuracy. 1 higher figure applies when a 4:1 torque enhancer gearbox is fitted. Our heavy‐duty rotary cutters with integral Accra‐Feed™ caterpillar infeeder/puller.